LAS VEGAS, NV – Over the years, DRAM heatsinks have gone from non-existent, to gaudy, to death traps with jagged edges, to some form of LED hell. In the middle we saw some DRAM vendors produce modules for water cooling with pre-applied water cooling pipes and heatsinks, but these were not overly popular. 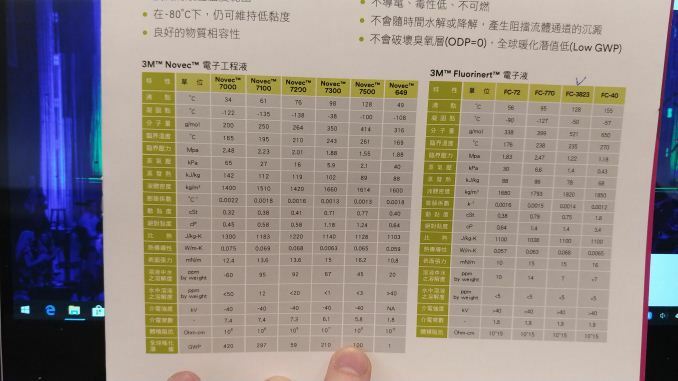 ADATA thinks they have the next step in DRAM cooling technology. 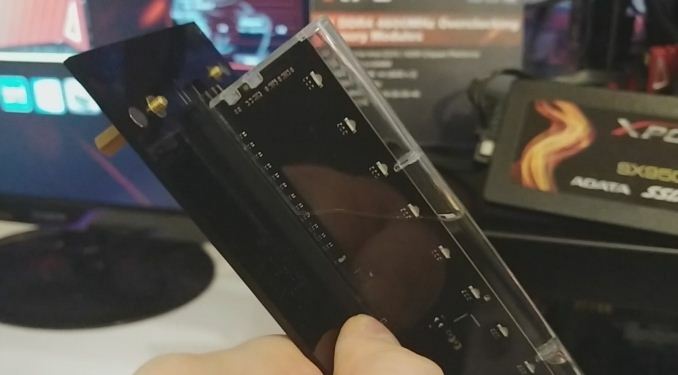 The concept of these ‘Jellyfish’ modules is that by using a sealed and clear plastic case around the memory chips, the case can be filled with a non-conductive liquid, such as 3M Novec/Fluorinert that we have seen in custom PCs and server cooling. These chemicals, basically long chain hydrocarbons with funny bits on the end, are liquid at room temperature but can eventually change state into a gas and rise. That state change can absorb a lot of energy being produced, and as long as the energy is removed and the chemicals become liquid again by cooling down, the liquid forms a convection current and in essence, a heat pump. Even if the chemical does not change state from liquid to gas, with the right viscocity, warm liquid will also cause a convection current. So cue ADATA’s Jellyfish: bare DRAM modules, in a plastic case, with about a spoonful of 3M Fluorinert. The modules also have a dozen LEDs for good measure. Normally this 3M liquid is not cheap: over 10 years ago, when enthusiasts realized that mineral oil PCs were more hassle than they were worth, a number of people experimented at a cost of $300 per gallon (they didn’t state US or UK gallon). According to ADATA, the 3M liquid is now about $100 per litre. If you want to do the conversion, it means it is more expensive today than it used to be. A spoonful of this stuff, per module, will still add some cost to a build. 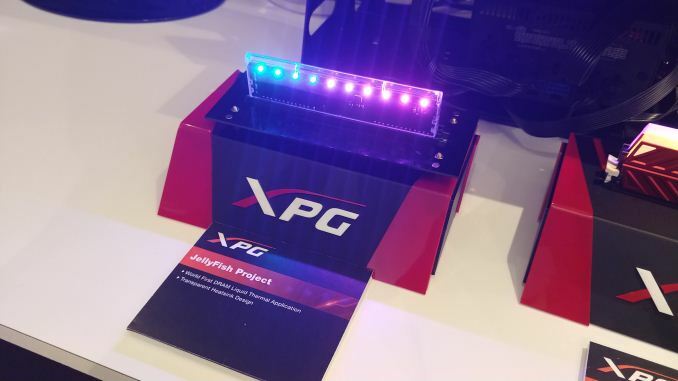 But as a prototype, it is certainly an interesting change from all the LED DRAM we see out there. One caveat, which ADATA noted, is that the prototype was not completely filled. This would mean that when placed vertically in a case, a couple of DRAM chips would not be covered. Jellyfish is still in its early stages of development, so if it ever comes to retail, there might be some changes. ADATA stated that due to the design, they have a patent on this technology, so it will be interesting to see if anything can come from that. This! And what PeachNCream said above. This! This! So much this! I paid +-USD75 for my 16GB 2133MHz HyperX Fury stick of RAM in November 2016. In November 2017 it was USD150. I just checked today and it is now USD165.